Grilling Season is Coming! Check out our list of the best propane grills on the market right now to be ready for a season of fun. We can smell the approach of grilling season like the Stark family from HBO’s Game of Thrones can smell winter coming. But, the Starks don’t wait until the last minute to prepare for battle, and you shouldn’t wait for your first cookout to prep for grilling season. Instead, check your grill to make sure it’s in the best working condition. If it is too old and cannot be fixed, now is the right time to buy a new propane grill. Shopping for a new propane grill can be fun, but it can also be a headache given the wide range of options available today. When choosing the best propane grill for outdoor BBQ, there are a number of factors you’ll want to consider such as size, style, and price before you commit to the purchase. Even if you already have those things in mind, choosing the right model is still no easy feat. Below are our picks of the best propane gas grills for outdoors available. Whether you’re looking for a small, midsized, or large propane grill, or just need a compact portable propane grill for camping or tailgating, we’ve got your back. Click here if you want to know what is the best natural gas grill on the market! Note: The terms propane and propane gas are used interchangeably in the BBQ industry. In fact, propane, propane gas, liquid propane, and LP all refer to the same thing when we’re talking about grills. Without a doubt, the Weber Spirit II E-210 is the best small propane grill for most people. This is the most economical Weber full-size gas grill and it comes with almost everything you would need for grilling at home. This small propane grill has 2 stainless steel tube burners that produce 26,500 BTUs in 360 sq. in. of cooking surface, which can cook up to 12 burgers and suitable for a two or three people family. Although this model is the most inexpensive Weber propane grill, it’s packed with the latest in Weber technologies, including the GS4 high-performance grilling system and iGrill 3. 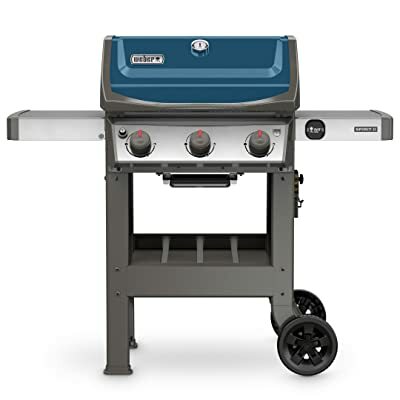 GS4 high-performance grilling system is the core of all Weber Spirit II and Genesis II models. It ensures burners that light every time, smoke-infused food grilled evenly and consistently, and hassle-free cleanup. GS4 grilling system is a game changer. It’s the key feature that makes Weber propane grills on top of the grilling market. iGrill 3 digital thermometer (sold separately) monitors food from beginning to end, displaying the real-time temperature on your mobile device. This Bluetooth device enables you to place one digital probe at the cooking surface to dial up the correct oven temp, and one probe in your food to monitor internal meat temp. Weber propane grills are your best bet if quality and convenience are things that drive your decision. They are easy to start, easy to clean, outstanding heat uniformity, and tend to last FOREVER. Stainless steel tube burners in Weber grills have a great reputation for quality and reliability and almost never break down within the first 10 years. No other propane grill in the world matches Weber propane grills when it comes to the combination of performance, usability, durability, and value. If you’re really interested in Weber grills but don’t know which model will suit your needs the best, check out our Weber Grills Buying Guide – How to choose the Best Weber Grill. 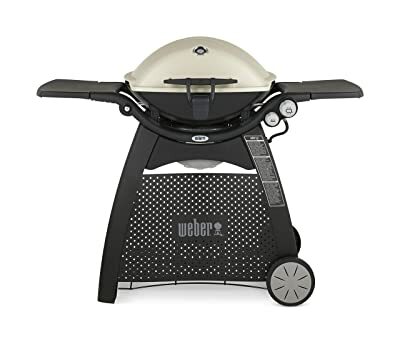 Weber Q3200 Propane Grill is the best small propane grill to get if you just have a very small space for placing your grill. This grill has a small footprint that fits well on the balcony at your apartment complex, and just as well in the backyard of a home. With side tables for placing spices, containers and whatever else you need, it’s convenient to have the extra space. The side tables are also collapsible that make it more compact for storage or to fit it into an even smaller space. This grill is small but it has enough room to grill an entire roast. With the power of two high-grade stainless steel tube burners, a large cooking surface (393 sq.in. ), and two convenient side tables, the Q 3200 can serve 3-4 people at the same time. All propane grills in the Weber Q gas grill line are made of painted cast-aluminum. They are durable, efficient, require minimal maintenance, and can withstand the heat needed to grill at any temperature. In addition, the shape of the lid and body allows for proper circulation of heat around the food for even cooking. As with all Weber gas grills, Weber Q’s burners are high-grade stainless steel tube burners. These burners are very durable and distribute heat evenly across the cooking surface. Each burner tube consists of a singular piece of steel with no welds, making them stronger and more resistant to rust and burn-through. Generally, the Weber Q 3200 is our pick as the best propane grill for small spaces or patios. In fact, this is among the most popular small propane grills on the market. If all you care is price, consider opting for a simple propane grill with an affordable price, such as the Char-Broil Classic 280 2-Burner Propane Gas Grill. The Char-Broil Classic 280 is one of the cheapest 2-burner grills on the market, only falls between $100 – $130, and might drop below $100 sometimes. It is one of the best propane grills for who live on a tight budget with only 1-2 people to serve at a time. In fact, this is the choice of many married couples without kids. Despite cheap price, this grill comes with some great features that may surprise you! It has two stainless steel 20,000 BTU burners with porcelain-coated heat tents allows for a wide temperature range and precise control. With 280 sq. in. of primary cooking space, this small propane grill can cook up to 11 burgers at once. The cooking surface measures 20-inches wide by 14-inches deep, and features porcelain-coated grates, which help prevent food from sticking and are easy to clean. 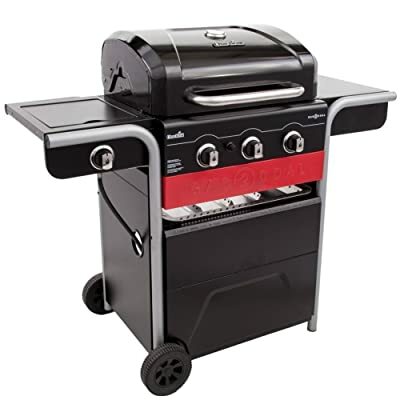 The Classic 280 propane grill is equipped with a Piezo ignition system for fast startups with the push of a button. The Piezo ignition system is a simple Electric Ignitor but we’ve found that this type of ignition system is very easy to use and quite cost-effective over time. 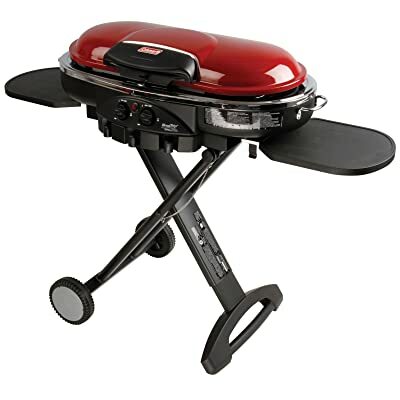 The grill sits on two 6-inch wheels for easy portability, and two fixed legs to keep it in place. Its small footprint means it will fit on just any small patio or backyard. It also features two metal side shelves for increased storage and prep space. Again, the Char-Broil Classic 280 is one of the best propane grills to buy if all you need is a cheap, small, propane-powered, easy-to-use grill. It’s cheap, but the material doesn’t feel cheap, not high grade either. Warranty is 5 years on burners, 2 years on firebox and lid, and 1 year on all other parts. For a small propane grill under $500, the Weber Genesis II E-210 is superior to all other models. This grill is only a bit more expensive than the Spirit ii 2-burner but provides a larger cooking space yet the more powerful burners. It also has a better look and features a sleek open cart design with bottom shelf that makes access to storage easy. 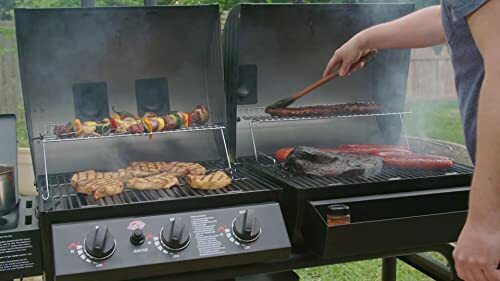 The grill also saves you valuable storage space with its propane tank storage area, located under the right side shelf, which allows you to connect and mount your propane tank underneath the side shelf. The tank mount features a handy gauge which allows you to monitor your fuel level. The Genesis II E-210 features porcelain-enameled cast iron cooking grids that have notches cut out towards the front, allowing you to easily see whether each burner is lit. The grill also has a tuck-away warming rack, providing you with an additional 198-inches of cooking space when you need it. Under the grids lies the triangular-shaped Flavorizer Bars that sit directly above the burners. These shield the burners by catching drippings and turning them into smoke, adding flavor back into your food. Overall, if you want a stylish, affordable, durable, and functional small propane grill, look no further than the Weber Genesis II E-210. The fact that this is the best propane grill under $500 you can buy at this time. Need a portable gas-powered grill for tailgating, barbecuing or camping? The Coleman RoadTrip LXE is your top choice. This BBQ is our pick for the best portable propane grill for most people. The Coleman RoadTrip LXE is compact and lightweight. It’s easy to assemble, stored, use and clean. It only took about 45 minutes to fully assemble this model. And for a grill that’s made of plastic and stainless steel, it’s remarkably stable. Its legs are easily folded to take up as little space as possible when not in use. It has plastic wheels that allow you to easily move it once it’s set up. All this makes it one of the best propane grills for camping, picnicking, tailgating or any activity that calls for a portable cooking device. 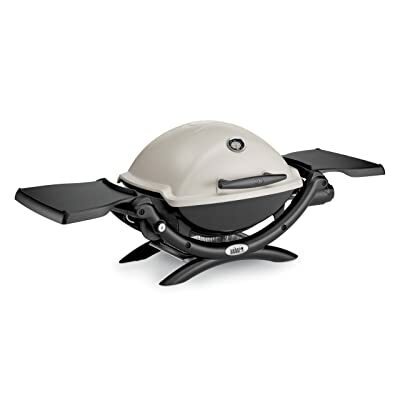 This portable propane grill features two independently adjustable burners that give you precise control for 2 temperature zones on a large 285 square inch grilling surface. These burners put out an impressive 22,000 BTU’s – which is a lot when compared to the other portable grills. The grill starts easily with a push button. It starts almost every time, heats up fast and hot and grills evenly. The Coleman RoadTrip LXE is a great portable grill for outdoor cooking. You can take it on the road and rely on it to work and provide a good grilling experience. It could also be a great addition to your apartment or condo patio. While researching this product and working with a diverse review team, we discovered that many people prefer it in the backyard over their giant backyard patio grill. Weber portable grills are the gold standard. The Weber Q1200 LP Propane Grill is simply among the best propane grills in the world when it comes to quality, durability, and versatility. It has a durable stainless steel burner that produces 8,500 BTUs and the infinite control burner valve allows you to set it to the precise temperature you need with an easy-to-use knob. An improved porcelain enamel finish extends the life of the 189-square-inch cast iron grate for long-term use. Split grates simplify cleaning and allow the use of optional accessories like a griddle over one side of the burner. 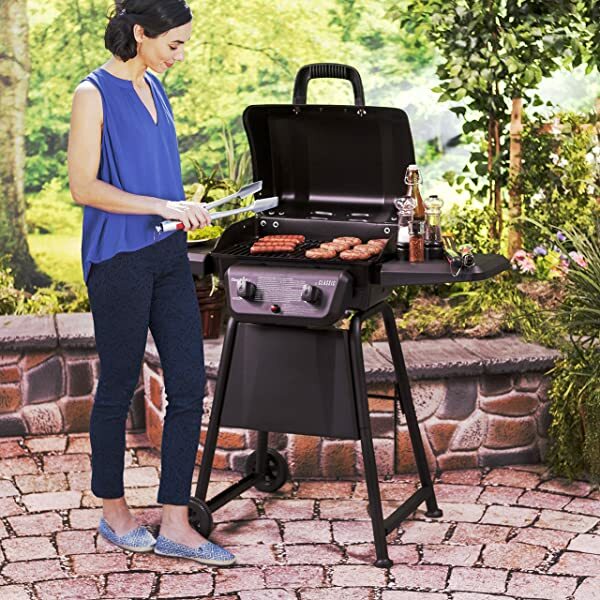 This Weber portable propane grill features two folding work tables so you have space to spread out, each with convenient tool hooks, and the tall cast aluminum lid is designed to expand your grilling area for larger items. It also features a cast aluminum body with drip ducts and a sturdy glass-reinforced nylon frame and handles. A removable grease catch pan is included to make clean-up easy. For the most part, we highly recommend you buy the Weber Q 1200 portable grill. This is one of the very best portable propane grills is that only costs under $300. Its solid compact design and ease of use make it perfect for tailgating, camping or small spaces like apartment balconies. Most of its parts are warranted for a period of five years, while most other camping grills offer a warranty for less than a year. You can’t go wrong with the Weber Q 1200 portable propane grill! Cook up a delicious meal in the great outdoors with the Blackstone 17 in. Table Top Griddle. Perfect for use at the campground and the tailgate alike, this portable grill delivers even heat distribution, and with rubberized feet for stability, it’s easy to produce a delicious meal every time. This grill boasts a sleek matte finish and stainless steel construction to hold up to the elements for the many camping and tailgating seasons to come! This little griddle grill features 1 stainless steel H burner that heats up fast and distributes 12,000 BTUs of power evenly across 268 sq. in. of cooking surface. With this cooking surface, this griddle fits 9 hamburgers, 9 pancakes, and 12 eggs – which is suitable for a small group of people. With the built-in grease collection system that collects all of the drippings, the griddle is very easy to clean. 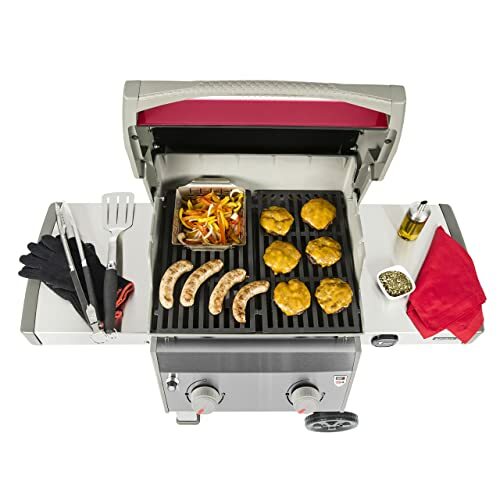 The Cuisinart CGG-180T Petit Gourmet Portable Tabletop Gas Grill is one of the lightest portable grills on the market. This grill weighs only 13.5 pounds, which is much lighter than most other portable models we’ve reviewed. 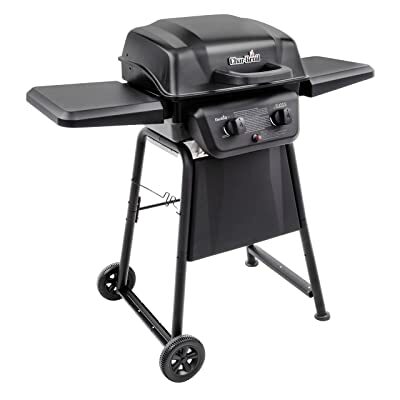 And although it is compact, its ample cooking grate is large enough to cook most family meals 8 steaks, 8 hamburgers, 6 – 10 chicken breasts or over 4 pounds of fish and is dishwasher safe for easy clean-up. The grill heats up very quickly and uses far less gas than a full-sized grill. It uses 1 pound canisters of propane that will allow up to 4 hours cooking time before needing to be replaced. Assembling the Cuisinart CGG-180T Petit Gourmet takes only 5 minutes or maybe less and requiring no tools. 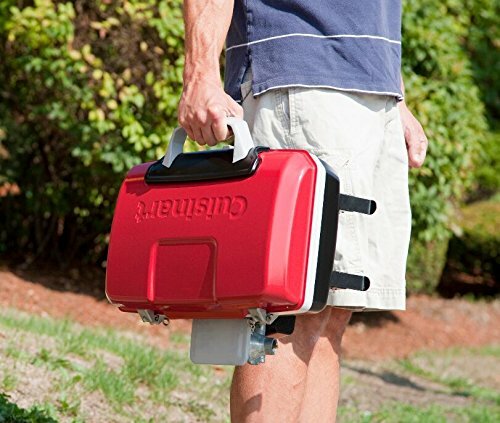 Folding legs, grill lid latch, generous carry handle, and the spill resistant drip tray all enhance portability. Overall, with its great portability features the Cuisinart CGG-180T Petit Gourmet can cook your meals wherever you go – the beach, the game, the campsite – anywhere! This is the best lightweight portable propane grill in our list. 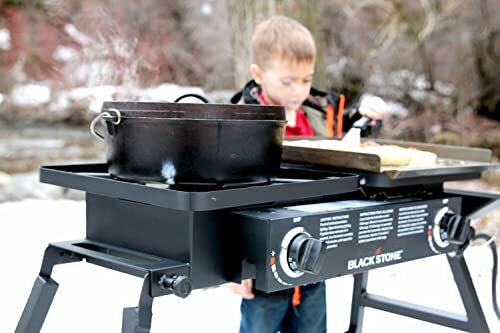 The Blackstone Tailgater Combo is the best propane grill griddle combo for tailgating. This grill has a dual cooking surface with two independent burners that give you the ability to cook different styles at the same time. The left side cast iron burner allows for intense heat, best used for stockpots, cast iron pans, dutch ovens. The right side stainless steel tube burner offers even, widespread heat, best used for griddle cooking. This combo offers 477 sq. inch total cooking surface, including a multi-purpose grill and griddle plate. This cooking surface is enough to cook 9/9 hamburgers, 4/4 steaks, 20/20 hotdogs. 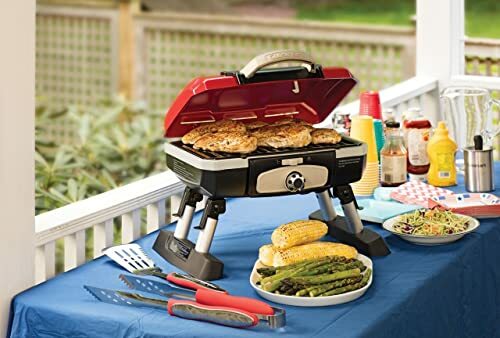 The grill has adjustable legs; means you can cook on any terrain and stay level. The legs are easily folded to take up as little space as possible when not in use. The Weber Spirit II E-310 is our pick as the best mid-sized propane grill for most people. It offers an unrivaled combination of top-notch grilling performance, a versatile three-burner design, durability, and an affordable price. The E-310 is larger and more versatile than the two-burner versions. It features three stainless steel burners; 424 sq. in. cooking surface, 30,000 BTU which can cook up to 14 or 15 burgers and is suitable for a family of 3 -4 people. With its overall compact size (helped by a new fold-down side table), the Weber Spirit II E-310 suits almost any patio or deck, but its grilling surface is big enough to cook a complete meal for a family. With a thick cast-aluminum firebox, it’ll last for years. This propane grill also incorporates the easily accessible externally mounted tank and under-grill shelf from the Genesis II line. On top of this, it’s a particularly easy grill to assemble, maintain, and use; and it comes in four colors. Finally, this is the best propane grill in its price range; at its current price, it’s a terrific value. 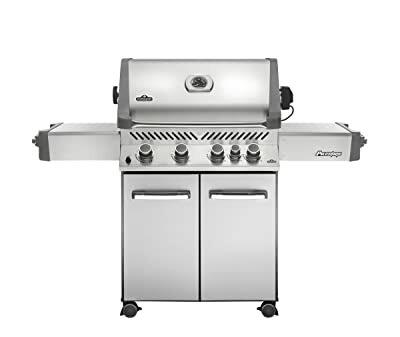 This affordable 3-burner propane gas grill from DynaGlo offers all the quality and cooking performance you have come to expect in a large high priced grill. With its space-saving design, it’s ideal for smaller patio and deck spaces. With a total of 36,000 BTUs over 507 sq. in. this grill provides plenty of grilling power for a wide range of cooking options. Featuring a double-walled lid to minimize heat loss, the design of this grill provides improved cooking efficiency of the burners. The control valves offer quick temperature control allowing you to cook your food with ease. An electric pulse ignition activates the burners, which are controlled by three dials to adjust the heat temperature for your specific needs. 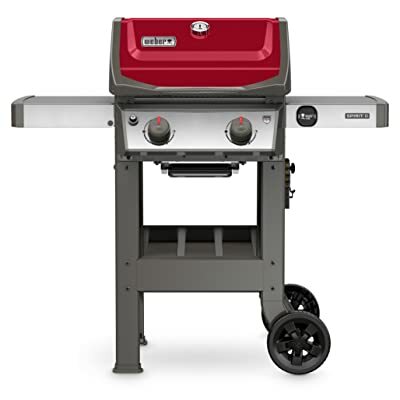 Additional features include drop-down tables with hooks and bars on either side of the grill to provide counter space and utensil storage, a single door cabinet with a “tank seat” propane storage area and two locking and two non-locking heavy-duty wheel casters at the base of the grill. Dyna-Glo offers only a 1-year warranty for this model. In our experience, products with that short of a warranty can be expected to wear out quickly. However, at its current price, you can’t expect more than that. We think this is a decent deal at this time. The Napoleon Grills Rogue 425SIB is the best propane grill under $1000 that is stainless steel on the inside and out. No other grill in its price range gives you such versatility with top-notch features and high-quality components. This grill has 3 high-grade stainless steel burners, stainless steel cooking grates and ﬂavorizer bars that are durable and built to last. It also features Napoleon’s unique SIZZLE ZONE infrared side burners, ACCU-PROBE built-in temperature gauge, and JETFIRE ignition system. Infrared side burner on the Rogue 425SIB can be used for pans and other accessories to cook your side dishes and sauces while the main meal is prepared on the cast iron cooking grids in the spacious grill head. Push start Napoleon’s JetFire ignition system allows the burners to start easily and quickly. As soon as you hear that “whoosh”, we’re ready to grill. As you lower the roll top lid, the Accu-Probe built-in temperature gauge located on the front face for easy interior temperature readout that is surprisingly accurate. The Napoleon Grills Rogue 425SIB can feed a group as you work culinary magic on 425 square inches of main grilling surface. With the ability to easily grill directly, or indirectly overheat that you control, it allows you to make marvelous meals for yourself or a crowd. Weber Genesis II LX S-340 propane grill is designed with the full grilling experience in mind and is built to last. 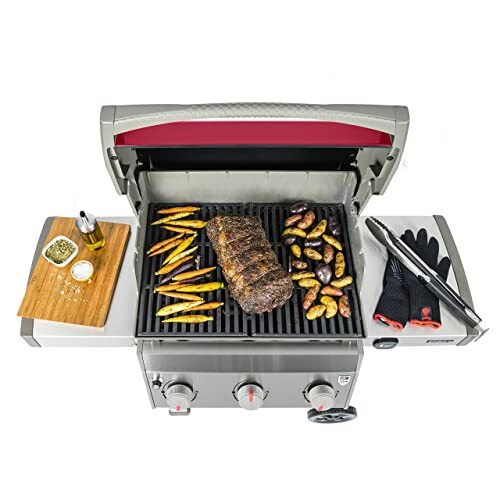 Each component of this exceptional grill was uniquely designed for ease-of-use and to provide an unequaled satisfaction to your backyard grilling experience. You can expect burners that ignite every time, smoke-infused food that grills evenly and hassle-free cleanup. The Genesis II LX S-340 features three 14,500 BTUs stainless steel main burners and a 12,000 BTUs side burner. It also includes stainless steel Flavorizer bars and 7mm stainless steel cooking grates. The cooking grates are designed with notches cut out towards the front, allowing you to easily see whether each burner is lit. The burners are lit by Weber’s reliable push-and-turn electronic ignition and are designed to taper towards the back of the grill. Since most grills tend to cook hotter towards the back, these burners reduce the heat on the back side of the grill, producing more consistent temperatures across the cooking surface. 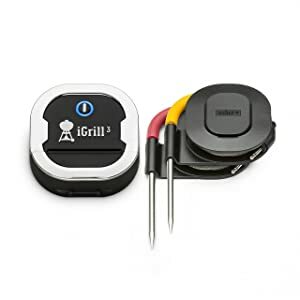 Plus the grill integrates seamlessly with Weber’s iGrill 3 (sold separately) and the free iGrill app that lets you monitor cooking remotely and offers temperature graphing, social sharing, gas tank monitor and many other features. Overall, if you’re a grilling enthusiast and looking for a top-of-the-line stainless steel gas grill for home BBQ, the Genesis II LX S-340 is no doubt one of the very best propane grills to get. This grill will enhance your grilling skills over time and make your life easier. The Weber Genesis II E-410 is our pick for the best 4-burner propane grill for most people. 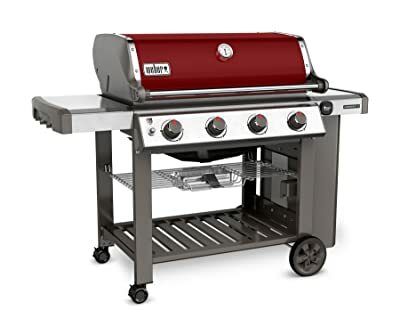 This grill gives you four burners and a choice of four colors—crimson (shown), copper, black, or smoke. The Genesis II E-410 has 844 sq. in. of cooking area gives you plenty of room to cook. With such a large cooking area, you can cook up to 28 burgers or more, serving a group of 8-10 people at once. And the grill also features 646 sq. in. of primary cooking area and 198 sq. in. of warming rack area, tuck-away warming rack folds down for easy storage. 4 high-performance stainless steel burner tubes deliver 48,000 BTUs of even and consistent heat anywhere on the cooking surface. The reversible porcelain-enameled, cast iron cooking grates empower you to be even more creative with your dish. The thin side of the cooking grate is ideal for delicate food such as fish and shrimp, while the wider side creates a thick sear mark enhancing the ﬂavor of your food. Of all the Genesis E-series models, the Genesis II E-410 propane grill delivered the best heating evenness, which means no matter where you place the food, the cooking temperature is the same. That’s important if you want to grill a batch of burgers and serve them all at once. Unfortunately, this Weber model doesn’t come with the side burner and infrared rotisserie burner. 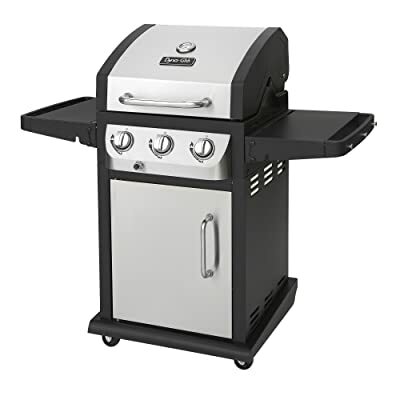 Overall, if you’re looking for a high-quality propane grill with a large cooking area and most needed features for grilling and indirect cooking at home, and at a reasonable price, the Genesis II E-410 is the best propane grill to buy. This model is covered by a 10-year warranty but you could expect it to last at least 20 years. The Dyna-Glo DGB515SDP-D is among the cheapest 5-burner propane grills on the market. This grill is cheap, but it doesn’t look cheap. Most of its components are made of stainless steel, except the wheels, making it look like a top-notch grill. This grill also features a side burner that puts out 12,000 BTUs for the side dishes that add the finishing touch to your BBQ cookouts. With 708 square inches of cooking space and 5 main burners that produce 50,000 BTUs of power, you can grill it all from appetizers to main course and sides. The stainless steel cart offers ample storage and the grill also includes temperature gauge and electronic pulse ignition system for fast start. This 5-burner propane grill looks good and seems to be a great deal. A stainless steel design and a side burner may be its selling points that make it attractive to customers. But if you’re serious to grilling and there is extra room in the budget, it’s better to invest in a higher quality and better-built propane grill. Napoleon Grills Prestige 500 is one of top selling large-sized propane grills because it combines high-end features normally found in the most expensive grills, but you don’t have to break the bank to get one. The size of the grill also adds to its popularity – it’s the right choice for a single person or a family of ten, with plenty of wiggle room in between. 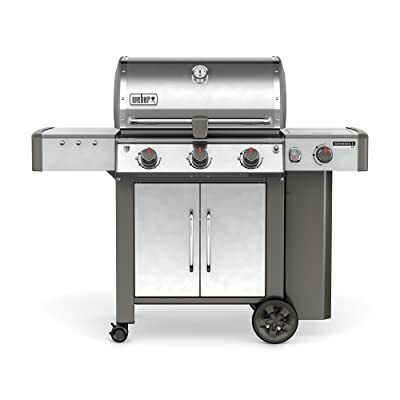 This grill has four stainless steel tube burners that provide up to 48,000 BTUs of cooking power. The Napoleon electronic Jetfire ignition with crossover lighting starts each burner individually for a reliable start-up every time and allows you to light all the burners at the same time. In addition to a total of 760 square inches of cooking area (500 sq.in. main cooking area, 260 sq.in. warming area), the grill also has an 18,000 BTU stainless steel rear infrared burner with smoker channel, a rotisserie kit for roasting or smoking, and a 14,000 infrared side burner for searing steaks. This gives you the ability to cook a lot of things at once as well as many types of food. The hood features an Accu-Probe temperature gauge and retains heat for oven-like performance. The stainless steel wave cooking grids are reversible. Easy set control knobs make grilling easy and clean up is a cinch with the full-width removable drip pan. This Napoleon propane grill is manufactured in Canada (while the Weber Summit series is manufactured in the USA). Its warranty is a standout in its class, making it one of the absolute best propane grills to buy. The grill is covered by a lifetime warranty on the exterior housing, cooking grids, and porcelain enamel coated lid. Napoleon also boasts a 10 year + 5 warranty on their burners and flame tamers that provides replacement parts at a 50% of normal cost for 5 years after the 10-year warranty expires. 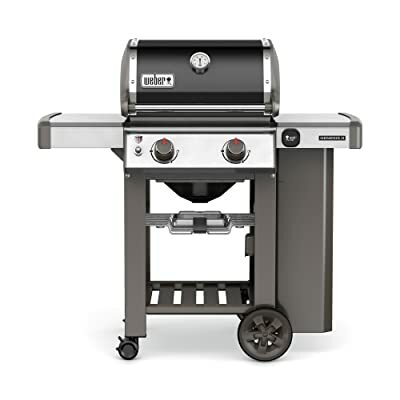 With all components are made of high-quality stainless steel for a look as exceptional as the quality, a large cooking area with some of the top-notch grilling features that allow cooking almost any food you can imagine, the Weber Summit S-470 is our pick for the best propane grill in the high-end segment. The Summit S-470 has four main burners at 12,200 BTU each, a 10,600 BTU sear burner in the center and a 12,000 BTU side burner. The primary cooking area is 468 square inches, and the removable warming rack is 112 square inches. It has a built-in rotisserie with a motor that drops down into the side shelf to be hidden away when not in use. There is a 10,600 BTU rear-mounted, infrared burner for the rotisserie. A smoker box with dedicated 6,800 BTU burner occupies the right side of the cooking area makes the grill a propane smoker. Main burner knobs are illuminated and there is an LED gauge on the control panel that displays how much fuel is in your propane tank. Each control knob has “Snap-Jet Individual Burner Ignition” for quick and easy lighting, each different burner has its own flame throwing ignition. This powerful ignition system is superior to any other ignition system we’ve ever seen. You’ll love this reliable ignition system. The Weber Summit S-470 is one of the absolute best propane gas grills that will make your grilling adventure more enjoyable than ever and we can’t recommend it enough. Weber has a long and well-deserved reputation for longevity, reliability and customer service; and the Summit is Weber’s top-of-the-line series. The flexibility, power, durability and longevity of this grill make it an obvious choice for people who can handle the price. It’s definitely worth it and actually great value. Who doesn’t love the convenience of a propane grill? Push a button and you’re fired up, which is why year-round grilling has become more popular. You won’t see many charcoal fans grilling on cold, snowy days. But come summer, they’ll argue that the charcoal taste beats all. 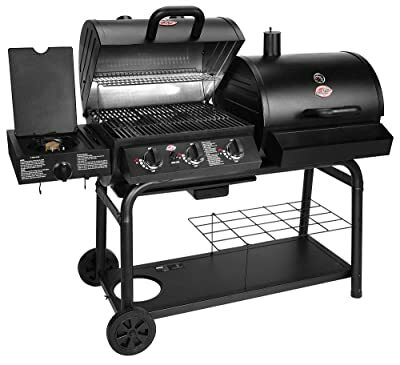 Propane charcoal grill combos, also known as hybrid grills or dual-fuel grills, like the Char-Griller 5050 Duo Gas-and-Charcoal Grill Combo, let you cook with both gas and charcoal. The Char-Griller 5050 Combo is the best hybrid grill you can buy today. This grill features dual primary cooking surfaces – one charcoal and one propane – with warming racks, for a total 1,260 square inches of BBQ grilling and smoking space. The propane gas side on the left produces 40,800 BTU with 3 burners with electronic ignition. 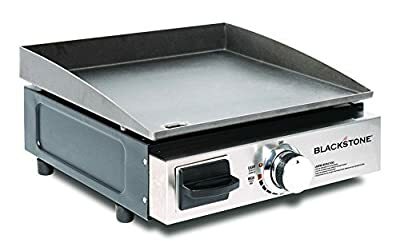 A side burner puts out 12,000 BTU with a flip-down cover converts to a fixed side shelf, offering increased surface space for food prep, utensils or dishes. There is no natural gas optional hookup. The barrel on the right is for BBQ charcoal grilling with a cooking surface of 580 square inches. Both sides feature porcelain coated cast and iron grates. You can also add an extra 250 sq.in. side firebox (sold separately) for low smoking. Adding a Side Fire Box allows you to tend the fire without opening the main grill lid and lets the heat and smoke transfer freely. Char-Griller makes some of the cheapest cookers on the planet. Their propane and charcoal combo grills have an affordable price tag that budget-conscious buyers often can’t pass up. The Char-Griller 5050 Combo is very popular. It looks solid, has good performance, easy to use and assemble. It’s the best grill for those who want to enjoy quick propane/gas grilling during the week and slow charcoal cooking on the weekends but don’t have much money to spend. The Char-Broil Gas2Coal is a low-cost 3-burner hybrid grill. This grill lets you cook with either propane or charcoal in the same firebox, but not at the same time. The idea is that the main burners can be used to light the charcoal, giving the user the option of using it as either a gas or charcoal grill, eliminating the need of a charcoal barrel and reducing the overall size of the grill. The charcoal tray is placed above the burners, holds one layer of charcoal and doesn’t allow to add more as you cook. There are three non-adjustable air intake holes, one on each side of the firebox and one at the bottom. The bottom hole also facilitates grease removal by channeling gunk into a small removable metal cup underneath. While starting the charcoal is effortless, the only way to control temps is using more or less fuel and opening and closing the lid. 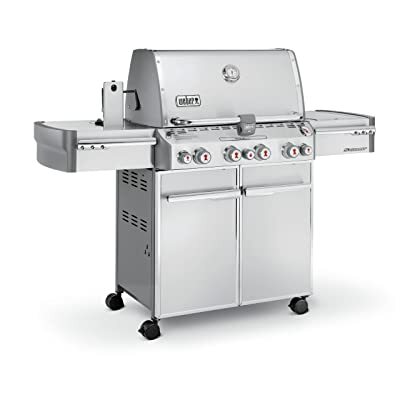 Three main burners feature 40,000-BTUs and allow you to grill 18-28 burgers, while one 12,000-BTU side burner is perfect for cooking your side dish. As a propane grill, the heat output is good, good enough to do some real grilling, which, of course, is something many cheap gas grills seem to have trouble doing. Ultimately, this Char-Broil Gas2Coal is the best cheap propane grill for who like the 2 for 1 concept that saves space and provides a bridge to the mysterious land of charcoal. In our view, it is not a bad propane grill and not a good charcoal grill. How to Buy the Best Propane Grill? You’ll want to learn the basics of all things grill related before you decide which propane grill is best for you, so let’s break it down. Here are some things you’ll want to familiarize yourself with before buying a propane grill. British Thermal Units (BTUs) is simply the way heat from a BBQ is measured. BTUs are measured in terms of how much heat a burner can generate while on high. A general recommendation would be to look for a BBQ that can produce around 100 BTUs per square inch of cooking space, so if you’re looking into a model with 400 square inches of cooking space, it should yield at least 40,000 BTUs. Typically, the higher the BTUs, the better, as you’ll have more control over the temperature of the burners which in turn can lead to more accuracy when grilling. However, BTUs alone do not guarantee better or faster cooking. What matters most is the actual surface on which you’ll be cooking your food. To select the best propane grill, it’s better to look for a high-quality, heavy, stainless steel or cast iron grill grate which will hold the heat in and cook more efficiently. What Size Propane Grill Do You Need? Are you cooking for a two-person family? A six-person family? Do you want to be able to host large outdoor parties and feed crowds of people? Are you using the grill in a corporate setting? The amount of people you will be grilling for is an important consideration which will help you determine the perfect-sized propane grill for your needs. Propane grills come in a variety of different sizes including portable, small, mid-size, and large models. The size of a grill is measured in square inches and can range anywhere from 80 to more than 1000 square inches of cooking space. Portable propane grills are perfect for camping trips and tailgate parties. They’re small in size, making them easy to move around, however, they are also capable of grilling up savory meats when you crave it most. Small propane grills typical contain 2 burners, can cook up to 15-18 burgers, and are ideal for a two to three person family. Midsized propane grills typical contain 3-4 burners, can cook between 18 to 28 burgers, and are suitable for most average families in the USA. This is also the most widely sold grill size. Large propane grills contain four or more burners, can cook more than 28 burgers at a time, and work best for big groups and entertaining purposes. With this grill size, people usually opt for a natural gas model. Quality, type, and shape of the burners are some of the most important features you’ll want to look out for. Do you want to be able to control the heat of each independent burner? Do you want to be able to cook many different types of foods? If so, you’ll want to consider a model with multiple burners, side burners, infrared burners, or rotisserie burner, as you’ll have more flexibility with your grilling. 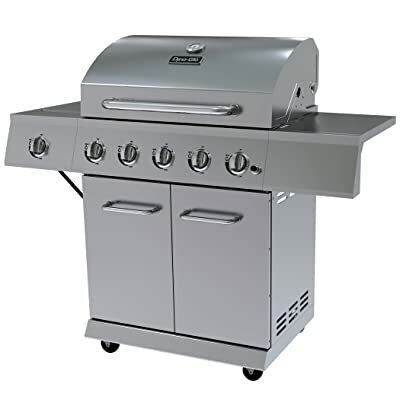 The best propane grill for you should also have stainless steel burners for durability. Stainless steel burners are not only high in quality but also relatively low maintenance. Cast iron burners and aluminized steel burners are a solid, but less popular choice when it comes to burner types. They won’t last nearly as long as stainless steel burners, and if they break down, it can be costly to repair. Cooking grates are an important part of any propane grill. The cooking grates are the surface on which you’ll cook your food, they are exposed to the most wear and tear of any part of your barbecue, so you want to be sure the quality is up to par. There are two main types of grill grates: cast iron and stainless steel. 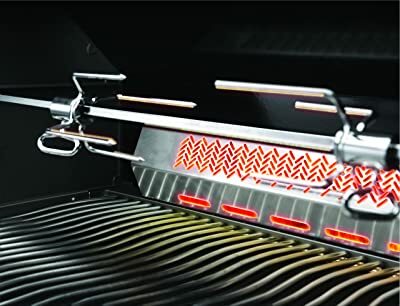 Stainless steel cooking grates often found on the higher-end models of gas grills (such as Weber Genesis II LX, Weber Summit, Napoleon Prestige Pro, Lynx, or Wolf). Stainless steel grates are virtually rust-proof, easy to maintain, and spread the heat evenly. Most propane grills on the market use cast iron cooking grates. Cast iron grates heat up quickly and hold their heat extremely well. These are the types of cooking grates that chefs use in restaurants. Cast iron cooking grates require more maintenance than stainless steel cooking grates and require seasoning before usage. But they are much cheaper. The Flavourizer bars (the inverted V-shaped pieces of steel that sit below your cooking grates) protect the burners inside your grill. You don’t want food residue dripping onto your burners, as the food can clog the openings of the burner where the heat comes out of. The Flavourizer bars not only protect the burners from getting clogged, but also almost instantly evaporate any grease or juices that drip from your meats down onto the bars, which can prevent flare-ups. In addition to this, the Vapourized grease also adds to the flavor of your grilled meats and intensifies that mouthwatering aroma you get when you grill on the ‘cue. There’s nothing quite like it. Above is our guide to some of the most important things you need to take a look when selecting a propane grill; and our list of the best propane grills on the market, we hope it will help you make the right buying decision!